Dorner’s 3200 and MPB Series conveyors are linked and run in an indexing mode, only turning when a spindle placed on the upstream conveyor breaks a photo eye. After the spindle transfers from the first conveyor (3200 Series) to the second (MPB Series), the photo eye clears. A time delay feature in the photo eye keeps the conveyor running for several seconds, allowing the spindle to reach the outlet end of the second conveyor. To prevent spindles from falling over at the far end, the controller is programmed to avoid jarring stops by slowly decelerating each spindle. The 3200 Series conveyor uses a one-inch diameter transfer tail as it butts up to the MPB Series conveyor. 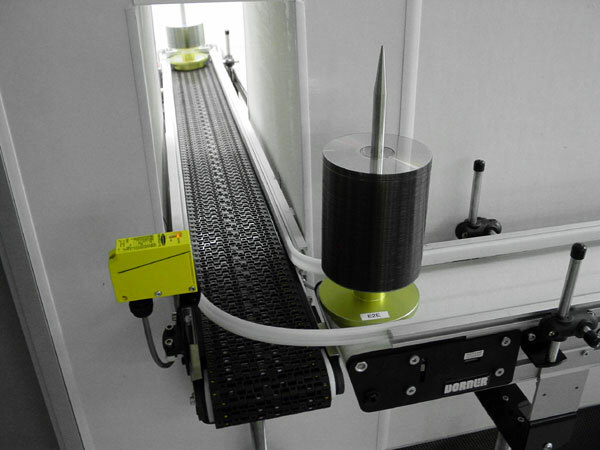 The small diameter spindle easily transfers a loaded CD/DVD spindle to the second conveyor. Adjustable guiding enhances the smoothness of the transition. The smooth operation and quality materials of Dorner conveyors helped this customer achieve their goals of smooth accumulation, minimal particle generation, worry-free 90° transfer, small space utilization, and unattended operation.